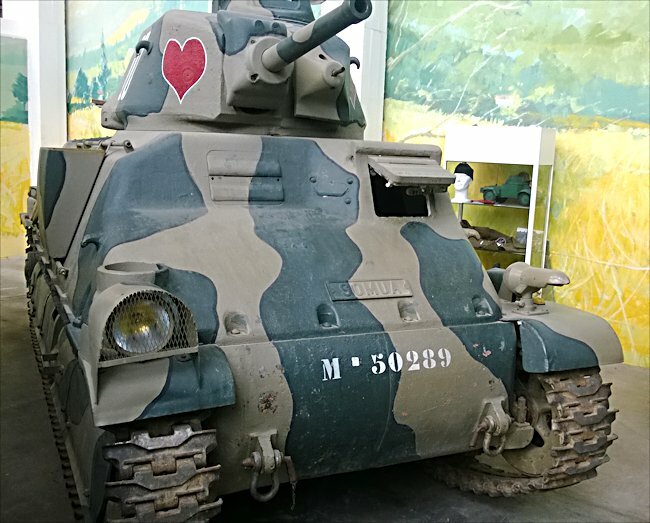 This French SOMUA S35 WW2 Medium Tank can be found at the French Tank Museum in Saumur in the Loire Valley. The Museum is called Musée des Blindés ou Association des Amis du Musée des Blindés, 1043, route de Fontevraud, 49400 Saumur, France www.museedesblindes.fr . The word Blindés means armoured. Apart from the restrictive one man turret the Somua S35 had excellent armour and a good gun for it's day and incorporated many of the best features in tank design to that date. The word SOMUA is an abreviation for the company name Société d'Outillage Mécanique et d'Usinage d'Artillerie. This tank is often called a char d'assaut or char de bataille which when translated means 'battle tank'. Henry de la Falaise was a Lieutenant in the 7/12 Lancers during the Battle of France in 1940. He recorded that the French tank crews of the 3rd DLM attitude at the time of the German invasion was that, "They were going to give the Boche a kick in the face that he will remember and which will send him reeling back to his homeland." The attacking German’s confidence was shaken when they discovered that shells from their 37mm guns bounced off the superior French and British heavy tank’s front armour. The French crews regarded their tank regiments as the mechanised elite. 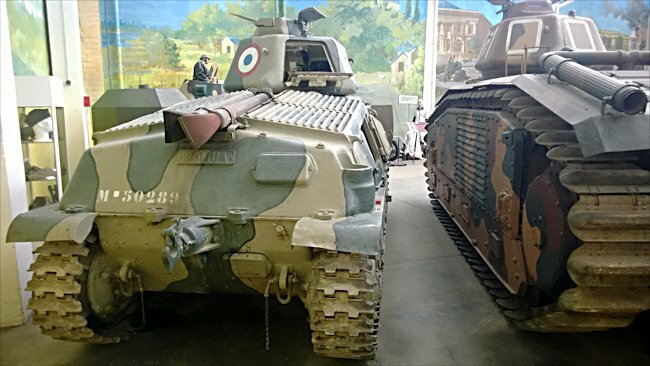 Compare the height difference between the French SOMUA S35 WW2 Medium Tank on the left and its bigger brother the Char B1 heavy tank on the right. Lt Henry de la Falaise wrote, "They were particularly proud of the new Somua tank with which one division was equipped and its wonderful 47mm anti-tank gun which they say will punch the German panzers so full of holes they will look like sieves by the time they get through with them." The Somua tank had a reliable engine and shielded suspension. 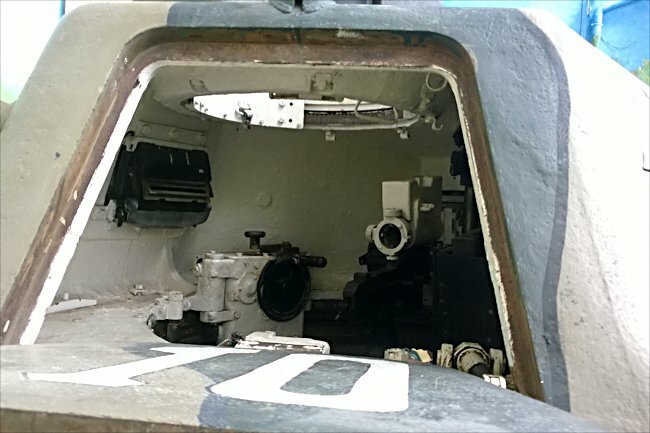 The problem with its design was that the crew fighting compartment confined one man to the turret. He just had too much to do. He had to be the commander, loader and gunner at the same time. French designers were paying insufficient attention to the needs of the tank crews who had to fight these machines. During the last stages of the first world war, France was the first country to produce an armoured vehicle that today, looks like a tank in that it has a turret turned 360°. It was called the Renault FT17. It was a crude two man tank, with light armour and only a machine gun for protection. The French high command took note of the German rearmament in the 1930s. A new production program ensure the French had far more sophisticated medium and heavy tanks than Britain or Germany by 1939, with much better armament and protection. At the outbreak of World War II the French had 3,254 tanks. Over 50% were light tanks, many only fitted with machine guns. This tank force was not only larger the matter the Germans, but also of better quality. On paper the medium and heavy French tanks were superior to Hitler's panzers. Somua S35 tanks had better armour and their 47mm guns packed a bigger punch with more penetrating power. That could easily slice through the thin 30mm frontal armour on the German Panzer II, III and IV tanks that took part in the battle of France in 1940. By 1940, there were 430 Somua S35 tanks in the French army. The French Somua S35 tank, if it had not broken down and had been supplied with enough fuel and ammunition, was had a good chance of surviving any tank on tank battle with German Panzers. It had stronger armour than their main battle tank the Panzer III and was better armed with a 37mm main cannon. A major failing in the French war machine was the lack of anti-aircraft protection given to its tank battalions and the lack of French fighter aircraft over the battlefield. The Somua S35 tank’s thick armour could not protect it from a well-aimed 500lb bomb dropped by a Luftwaffe Stuka dive bomber. "The planes approached us in close formation. We immediately accelerated and dispersed. I closed by armoured driver’s hatch. The planes have arrived. They are going to bomb us. But no, they topple over in the sky as if they have been hit and dive down towards the ground." "There is a mournful sound, a long scream combined with the growling sound of their engines. I feel like they are going to dive on to my head. Then there are explosions that make you believe that the whole world is being thrown into the air." "Our Somua S35 tank is thrown on its side. I think we are going to topple over. I panic and turn off the engine. We fall down on to our tracks again. There is silence. Then some way away from me, powerful explosions are to be heard; the ammunition lorry that has just supplied us is lying on its side and the ammunition is exploding." "Twenty metres away from us, one of our tanks has turned over and has come to rest on its turret. The lieutenant shouts, ’Get going, goddammit, full speed ahead.’ After two more air raids only nine out of the sixteen tanks that started that morning were still in working order." "During our first tank battle the day before our Somua S35 Tank’s thick our had protected us. I counted twenty hits. The heat generated from shells as they hit the exterior burnt the white painted armour inside the tank brown. The armour protected us from the nearby bomb explosion. There were more burnt brown marks on the inside of the tank after the dive bomber attack." Having survived three air raids by Stuka dive bombers the previous day Jean–Marie de Beaucorps a French 18 year old Somua S35 tank driver in the 2nd Regiment de Cuirassiers, 3rd DLM was attacked near Merdrop by more than two hundred German panzers backed up by artillery guns. This was his second tank engagement of the war. He recalls, "Smoke, dust, I cannot see much. I try to drive in a straight line and then there is a terrible crash. Our Somua S35 tank is lifted off the ground and falls back down on its tracks. My legs are slammed into the side of the tank hull and I fear that they might be broken. Behind me the light has gone out. The tank turret has been torn off. It was probably hit by a large shell." "In front of me the curtain of dust and smoke is still thick. I do not know where I am, nor where I can find friend or foe. I turn around. Our Gunner has been flattened at the back of the tank. He must have been crushed when the turret fell off. The Lieutenant, the tank commander, has totally disappeared. He has flown away along with the turret. " "Then all of a sudden a German tank appears close to mine, about twenty metres away. The presence of my tank, immobile, half destroyed, does not deter him. A second tank joins him. They are smaller than my tank. Their guns are relatively small in calibre. They must be light tanks. Mark I or mark II panzers." "I start my engine and engage the clutch. My tank must have jumped forward because without the turret it can go a lot faster. They have no time to move before I ram into them. All I can hear is the sound of tracks grinding into the metal. They cannot escape." "As if in a dream I light my phosphorous grenade and place it on my seat. In five seconds it will emit flames and intense heat that will burn my tank. The flames will engulf the two trapped German light tanks. I scurried to the rear of my now burning Somua S35 tank. One jump and I am outside." 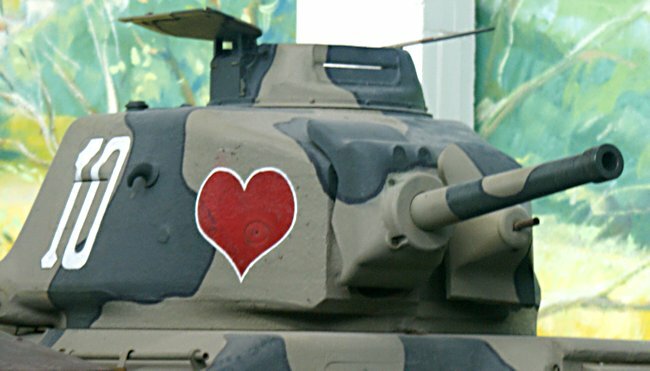 Only twenty four out of the eighty-two tanks that participated in that tank battle survived. It turned into a running battle that went on until the evening of the 14th May 1940 between Wavre to Namur. Greman losses were heavier. Around 135 German panzers were out of service or knocked out. Because the French Cavalry corps retreated from the battlefield the German engineers were able to recover and repair many of their tanks. On 21 May 1940 the German panzers suffered a real setback. Near Arras a depleted French light mechanised division with some 70 Somua S35 tanks and British armoured Brigade with another 74 tanks, successfully attacked three German divisions. Unfortunately, in the confusion. The British units found themselves under attack by the French. They retaliated and knocked out four French Somua S35 tanks before they realised to their horror what was happening. The Germans eventually stopped the Anglo-French counter-attack by using the only effective weapon in the arsenal, the 88mm anti-tank gun. France pioneered their first armoured division, with a combination of tanks, armoured cars, motorised infantry and artillery. It was called the Division Legere Mecanique (DLM - Light Mechanical Division). Like many other nations in 1940, Francis cavalry consisted of some units still mounted on horseback whilst others motorised. In the mid 1930s France created to entirely motorised armoured light divisions, that were equipped with a brand-new SOMAU S-35 tank. Although called 'light' divisions, they were well-equipped units that were equivalent to a German Panzer division. They had 300 armoured vehicles, including 190 tanks. By the beginning of 1940. There were four of these divisions in the French army. In 1939 the French army formed a heavier armed unit called the Division Cuirassee (DCR). These contained Char B1 heavy tanks and some older Char D2 tanks as the main striking force. Medium tanks like the Hotchkiss H35 H39, Renault R35 and the Somau S-35 tanks equipped the DLM. While the French had some excellent medium and heavy tanks. The variety of different types caused logistic problems. The French ordnance officers and quartermasters add to make sure the correct spare parts and ammunition were sent to the right units when needed. This often did not happen. They were unable to get into position until the 22nd due to fuel shortages and crew exhaustion. The 3rd DLM could only muster around 60 Somua S35 tanks. It had already lost all its Hotchkiss H35 tanks. Many French tank losses was down to the fact that the tank battalions fought singularly and often just company or platoon strength rather than en masse as a Battalion. This resulted in them being surrounded by German panzers who could then fire at their weak spots on their rear and sides. Where can I see other SOMUA S35 tanks?